When I was in secondary school, History was my favourite subject – covering the likes of the Cold War, Vietnam and, of course, the Civil Rights movement. I lapped up the knowledge – I knew the dates of landmark legislative achievements, sit-ins and boycotts off by heart. Unlike all the topics we had been taught before, here black people were finally making an appearance in history as celebrated heroes, not the tokens or sidekicks. The likes of Martin Luther King, Rosa Parks, and Ruby Bridges were the centre of my learning. The heavy focus on America’s violent relationship with race distracted from the fact that this was not my history. I still had no idea how or why black and brown people had ended up fighting in the First World War for Britain. I knew extensively about Harriet Tubman and the Underground Railroad, while this country’s history of slavery and the use of slave ports in London, Liverpool and Bristol remained unanalysed. We managed to cover the 1955-56 Montgomery Bus Boycott and yet the Bristol Bus Boycott of 1963, which led to the employment of the first non-white bus conductor, didn’t so much as get a look in. Rather, our history lessons positioned Britain as America’s demure and less racist cousin. I remember often feeling jealous of African Americans and the way in which they could refer to the rich history of activists like Stokely Carmichael, Assata Shakur, and Angela Davis with ease if ever questioned about their greatness and the achievements of their people. As a young person of colour discovering the weight of racialisation and the way in which the world perceives, how do you begin to foster pride in your heritage when you’ve never been taught about it and the country you live in is portrayed as some sort of utopia where racism doesn’t really exist? How are you meant to navigate discussions and experiences with race when you don’t even know your history? However, it’s one thing to present and introduce histories, theories and concepts and it’s another to make it accessible, engaging and entirely without pretence – something that Reni manages with ease. Perhaps it’s because of the conversational tone that Reni carries through the book – rather than loftily throw facts at us, she muses and explores race alongside us. Perhaps it’s because Reni feels like one of us, a young person of colour fed-up with disingenuous conversations about the racist system we live in and its impact on their life and personhood. Reni takes the histories she has presented us with and grounds them firmly in the present, touching on issues such as the casting of a black woman as Hermione Granger in the stage production Harry Potter and the Cursed Child, Lena Dunham and the perceived threat of black feminism to the sensibilities of white feminism, and the impact of Stephen Lawrence’s murder on racial discourse – this last a case many of us grew up seeing on TV. 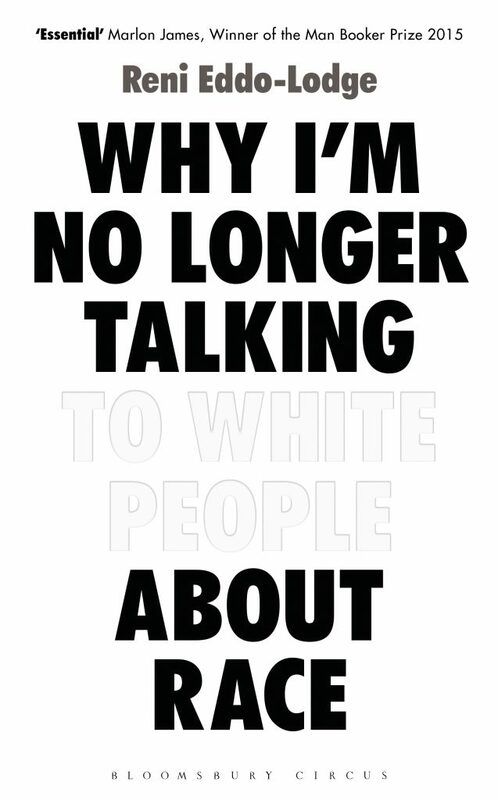 Why I’m No Longer Talking to White People About Race is an affirmation of the feelings and thoughts that have crossed my mind but have never uttered. I owe Reni for filling the gaps in my knowledge with statistics, facts and case studies. I owe Reni for providing me with these stories of heroes much closer to home, such as Dr Harold Moody, John Fernandes, and the Newham Monitoring Project team. I owe Reni for doing much of the hard work and instigating dialogue that I’ve never had the time to do, often put off, or simply found too painful. You can find spots to buy Why I’m No Longer Talking to White People About Race here, and follow Reni’s work via her website and Twitter.